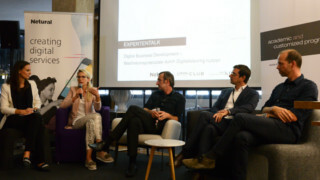 IFI-Professor Matthias Fink and Netural-founder Albert Ortig have been the keynote speakers at the expert talk organized by LIMAK Austrian Business School and Netural together with the LIMAK Club on 13th September 2018 in the Tabakfabrik Linz. Matthias Fink and Albert Ortig pointed out why the human being might be the most important factor when it comes to digitalization. Whilst technologies permanently broaden the frame of feasibility it might be the digital mindset of human protagonists making emerging potential capability accessible. After the talk the key note speakers discussed their approach to digitalization together with Dr. Thomas Windischbauer MBA (Management board member, Silhouette International Schmied AG) and Tina Hawel, BSc MA (Director, forte FortBildungszentrum Elisabethinen Linz GmbH).